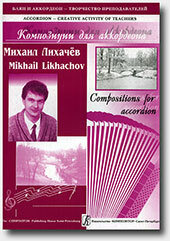 Mikhail Likhachov is accordion teacher of Children's musical school of a name V. V. Andreyev, composer, poet, head of instrumental ensemble "Cottage". 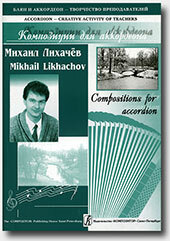 Mikhail is distinguished by a surprising creative orientation by all of his life. His many cultural initiatives which are put into practice, became significant events in life of St.-Petersburg. It is enough to name some examples. The successes of Mikhail in creation of a lot of lyrical songs are highly marked by the professional colleagues-composers. The song written by Mikhail Likhachov about native Moscow district of city became an official hymn of one of the largest territorial formation of St.-Petersburg. Other direction in creativity of Mikhail Likhachov is the poetry. He issues two books of author's verses "Dreams are, undoubtedly, brighter..." and "As the destiny is at times changeable...". It is necessary to note, that as a source of creative inspiration Mikhail for itself considers a unique atmosphere of palaces and parks of suburbs of St.-Petersburg, the park of Pavlovsk is especial, where many compositions were written by him. The special relation of the musician to Pavlovsk reflected in some perfect creative undertakings. Mikhail has written an instrumental composition "Pavlovsk in the Evening", including in the same album of instrumental music and becoming original by the visiting card of park and museum. And to the 225-years anniversary from the date of the Pavlovsk palace and park ensemble basis he has organized the exhibition of the photo works under the title "Theatre of trees". The love to native city and its suburbs was reflected even in the name of own instrumental collective created by Mikhail in 1992. It is named on a name of one of suburban palaces - "Cottage", and this name reflects an orientation of musical creativity of collective on salon sounding focused on performance of the European music in interiors of ancient palaces rooms more precisely. The 2003 is marked by an anniversary - 300-years from the date of the basis of St.-Petersburg. This event also has served as a source of inspiration for Mikhail. He creates an author's album of songs "Birthday of Northern capital", produced on compact discs and cassettes - the presentation of this album with success has passed on the eve of anniversary of city. In addition to a disk publishing house "Compozitor" has issued the musical collection of songs included in this album. It is necessary to say about more than 20-year's teaching work of Mikhail Likhachov at Children's musical school of a name V. V. Andreyev. His pedagogical method is distinguished by a constant orientation on search of the new approaches in music education. He works with the stu¬dents in much after-hour time, creates cycles of lectures-concerts involving children in musical life. Music of Mikhail Likhachov often sounds on various radio channels of St.-Petersburg, the directors of city radio company repeatedly created thematic programs about creativity of the musician. At the present stage of life Mikhail Likhachov is in continuous creative search, he is filled up by forces and energy for creation of the new projects, he is keen on work and art.